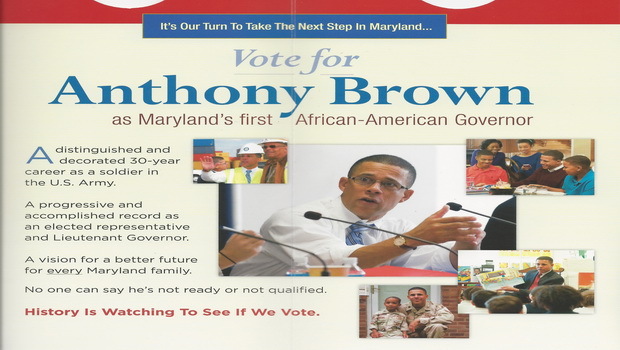 The Maryland Democratic Party has been sending out mailers to heavily African American areas telling them to vote for Anthony Brown because “it’s our turn” to have the state’s first black governor. The mailers and handouts, which have offended some older white voters who saw them, visually tie Lt. Gov. Anthony Brown to Martin Luther King and President Barack Obama. “We’ve come a long way in our journey,” says the cover of one mailer. The strong appeal to African Americans is hardly a surprise, since they are essential to any Democratic win. They make up 30% of Maryland’s population, 25% or more of the likely voters, and nine out of 10 vote Democratic. But urging them to “Vote for Anthony Brown as Maryland’s first African American governor” is unusual in a race where the candidate rarely brings up his own race, though many others do. When Attorney General Doug Gansler, a Brown primary opponent, told a group of volunteers last year that “I mean, right now his campaign slogan is, ‘Vote for me, I want to be the first African American governor of Maryland,’ ” the Brown campaign jumped all over the secretly recorded remark which was leaked to the Washington Post. Now the state Democratic Party is using the same message as part of a massive push to get out the vote (GOTV) among the party’s most reliable supporters. On Sunday, there was a huge “Soul to the polls” effort asking pastors of mostly black churches to urge their congregants to vote at early polling places after church was over. Anthony Brown seems still somewhat ambivalent about the racial appeal, at least in front of a largely white audience as he was Oct. 18 in a TV debate broadcast on four stations. Anthony Brown and Larry Hogan at Oct. 18 televised debate. “WBAL reporter Deborah Weiner: Lieutenant governor, if elected, you would become the state’s first African American governor in the state’s history. Does race matter in this race? Anthony Brown: I understand the significance of race and certainly the historical significance of being elected Maryland’s governor. I’ll be only the first African American elected governor in the history of this state and only the third in the history of this nation. I think where race has more significance is when we look at, for example, education and the question was raised about the achievement gap. We have an achievement gap along racial lines and that’s why I support universal pre-k to help close that achievement gap. We talked a little about health care, but I wish we would have talked more broadly about health reform because we know that we have health disparities by both race, ethnicity and geography. That’s why I led the effort to create health enterprise zones to address those disparities and to eliminate the difference in outcomes along racial lines. So I think race is important to the extent that the quality of life goals that we achieve ought to be experienced uniformly by all Marylanders regardless of where your family lives, where they’re from, race, ethnicity or nationality. Moderator: Mr. Hogan, the same question to you. I don’t think race has any part whatsoever in this race for governor, and the people I talk to around the state don’t really care about whether the next governor is going to be white or black, Asian or Hispanic. They’re looking for somebody that’s gonna turn the state around. They don’t want to go in the same direction. They’re looking to move Maryland forward rather than continuing to move backwards. I don’t think it should be an issue. And I don’t think it is an issue. Race has almost always been an issue in Maryland elections since the Civil War. It was dominant racist Democrats who engaged in black voter suppression in the 19th Century, and most Maryland blacks were Republicans until the 1930s and President Franklin Roosevelt. The parties have switched roles, and Democrats have used racial charges to defeat Republican candidates, such as Ellen Sauerbrey in 1998. African Americans have also complained about being made to “wait their turn” by Democrats for far too long. The first African American ever elected to statewide office was Republican Lt. Gov. Michael Steele, chosen by Gov. Bob Ehrlich. Now, no ticket for governor and lieutenant governor in either party is made up of two white males. Hogan’s running mate, Boyd Rutherford, is black. Stung by the loss of the governorship to Republican Larry Hogan, Sen. Barbara Mikulski told a crowd of 500 cheering Democrats, “We take a pledge that we will never again lose a statewide election.” Beyond that, she said it is not enough that nine out of 10 members of Maryland’s congressional delegation are Democrats. She wanted a “100% Maryland delegation” of Democrats.